How much do we actually know about the concept and history of this sociological term, which is rapidly gaining popularity? In 1988, Academic and Feminist, Peggy McIntosh wrote a 50-point essay, identifying and noting down some of the daily effects of privilege in her life as a white person living in the U.S.
‘I can be pretty sure of having my voice heard in a group in which I am the only member of my race’. As the word ‘privilege’ is often associated with the upper classes; people who went to private schools, those who got a car for their sweet 16th, those who have hired ‘help’ or people whose parents paid their rent throughout university, many white people who come from low socioeconomic backgrounds negate the concept of white privilege. White privilege doesn’t mean that you are born into money, that’s class privilege. Turn on the television or open to the front page of the paper and see people of your race widely represented. If you wish, you can arrange to be in the company of people of your race most of the time. If you buy “flesh” coloured items like band-aids or stockings, they will more or less match your skin tone. If you were able to use the original suite of emoji’s, the ‘thumbs up’ or ‘peace sign’ hand gestures represented your race. You can easily can find picture books, greeting cards, dolls, toys and magazines featuring people of your race. Being born white means that you were born into a system that validates and reaffirms that you are socially included – and being socially included, is a very valuable privilege. And lastly, unlike class, a person cannot hide their race. A school teacher named Jane Elliott was living and working in segregated 1960s America where black citizens’ civil rights were perpetually denied. She became so affected by the widespread prejudice, particularly after the racially motivated assassination of Dr. Martin Luther King, that she made an effort to teach her students – the future generation – how illogical it is to discriminate a person purely because of the way they look. Like skin colour, eye colour is determined by pigmentation and Elliott’s classroom became a ‘society’ where brown-eyed students were privileged over blue-eyed students, and then after time, reversed this blue-eyed children to feel superior. By creating a microcosm of power and prejudice, where children were briefly exposed to both, Elliot was able to impart on them a life long lesson about the absurdity of racism and of white privilege. Since then she has replicated this exercise for adults around the world. You should know that the opposite of privilege is disadvantage. While a person might not feel like significant opportunity (like the private schooling or the car) has been handed to them on account of their whiteness, on the flip side – and more importantly – disadvantages haven’t either. White privilege doesn’t mean that you get to walk into a supermarket, shoplift and not be reprimanded. Instead, it means that you are less likely to be racially profiled and followed around by store security with the assumption you’re going to steal, because you’re not white. To have marched in a protest in order to demand equal rights for, or call out the suffering of, your race. Do you have the privilege to avoid having your race, religion and cultural identity made into a costume and worn by a group who have oppressed your people for hundreds of years? To understand privilege, you need to understand disadvantage. What disadvantages does a person avoid by being white? 5. You should know that … “You have white privilege” does not automatically translate as ‘you are a racist’. In the words of Peggy McIntosh, “I was taught to see racism only in individual acts of meanness, not in invisible systems conferring dominance on my group”. Having your white privilege mentioned doesn’t mean that you are being labelled as someone who is actively prejudice toward non-white people. Instead, it is making the point that as a white person, you receive benefits from being the dominant ethnicity in society. Also admitting that you have white privilege doesn’t conflict with your own acceptance of diversity. 6. You should know that … The greatest trick white privilege ever pulled was convincing the world it doesn’t exist. The myth of the meritocracy, and the fallacy that at some magical point in the last few decades, is that racism was not only abolished, but was slowly replaced with ‘reverse racism’ and that white people are now the disadvantaged group. This has made the realities of white privilege more elusive than ever before. This can be seen in levels of representation in all of our institutions, both in terms of under representation of non-white people in positions of power and influence, and in the over representation of non-white people in prisons, in poverty, in unemployment and in all of the areas that – in an Indigenous context – create the ‘gap’ that we are forever trying to close. 7. You should know that … Acknowledging white privilege isn’t enough to end it. Because so few people acknowledge the existence of white privilege, and because it can feel like such an overwhelming awakening to finally see it, many people feel that the work is done simply by acknowledging it. While this is an important first step, it doesn’t actually do much to reduce it, or to eventually end it. Privilege should be distributed in order to actually spread the social, policitical and economic opportunities and advantages to other groups. For example, rather than just acknowledging the existence of Indigenous arts organisations, using the resources of Indigenous peak bodies and the skills of their artists will be active in making change. The same principle goes for actively using Indigenous run businesses and distributing the wealth of employment. Also, having equal representation in the media and advertising. And distributing the wealth of policy and decision making. Australian arts sector needs to recognise and legitimise Indigenous peak bodiesNot enough people are aware of the creative Indigenous institutions and Koori producer Merindah Donnelly is continuously trying to educate the wider society about Indigenous arts’ peak bodies. 8. You should know about … The role of white privilege in ‘reverse racism’. 9. You should know that … It’s not the job of those who are disadvantaged by white privilege to calmly educate white people about it. 10. You should know that … Pretending that colour doesn’t exist is not the solution to abolishing white privilege. Race may be a social construct, but that doesn’t change the fact that racism is real; that people are different colours, or that the consequences of this history have not been redressed or removed from the society we still live in. Taking the “I don’t see colour” approach may sound like a great idea in theory, but it doesn’t undo the impacts of racism. At best, what it does do is allow you to wipe your hands of playing an active part in the work that needs to be done to eradicate racism, and at worst it means you are perpetuating the existing status quo by denying the identity and the very real experiences of people who live with the realities of racism every day. Also, isn’t it funny how many white people are ‘colourblind’ compared to non-white people? Having the opportunity to pretend that race doesn’t exist the epitome of white privilege. The fact remains that our nations were here before any Europeans came? ?, says David Treuer. When the Ojibwe writer David Treuer was growing up, he says, there were a few things that showed up in every Indian household he would visit: a Sears catalog, a Bible, a picture of John F. Kennedy and a copy of the book Bury My Heart at Wounded Knee, Dee Brown’s influential chronicling of 19th-century Native American history. But the contents of that book, famous as it was, proved complicated for him. The story it told was one that clashed, in important ways, with his own lived experience of reservation life and Native culture. Americans of all backgrounds have recently had cause to revisit the place of Native Americans within national life. President Trump has invoked the terror of Wounded Knee to make fun of Senator Elizabeth Warren and a heightened dialogue continues over a stand-off between Covington Catholic student Nicholas Sandmann and Omaha elder Nathan Phillips on the National Mall last Saturday. But from Treuer’s perspective, thanks to centuries of history — and that famous book — many people are going about that thinking all wrong. He spoke to TIME about Warren, the problem with tragic storytelling and his new book, The Heartbeat of Wounded Knee: Native America From 1890 to the Present. You describe your book as a “counternarrative” to the 1970 history Bury My Heart at Wounded Knee. What was your reaction the first time you read it? It was in every Indian household, but I didn’t read it until college. I remember feeling both applauded and eradicated. It tries to draw attention to a legacy of injustice, but on the other hand it says the massacre at Wounded Knee in 1890 was the point at which Indian culture and civilization died, period. I remember reading that as a student at Princeton, far from home, missing my tribe and thinking how preposterous it was. You write that Indians “get ourselves wrong” in that sense, too — did you have an “aha moment” when you realized that? I don’t know that there’s one. Growing up, my reservation was something to escape and I felt that way I think because I bought the story and I assumed the role of the sufferer. It was only when I was removed from it that I had a chance to look back at the place I was from and recognize that Leech Lake Reservation, my home, wasn’t simply where good ideas go to die, that there’s a richness and complexity to our lives that I hadn’t previously noticed. What went into the decision to mix new reportage in with the history you’re recounting? Since this book is not about Indian death, it’s about Indian life, I knew I had to talk to Native people in the act of living. I also felt strongly that I couldn’t ask them to share unless I was going to take a corresponding journey. It didn’t feel fair to hang people up and hide behind them. Was there a specific misconception you most wanted to set right? I was most interested to wean ourselves from the tragic mode. Tragedy in the Aristotelian sense is a story that elicits strong emotions and which leads to a moment of catharsis. That kind of narrative doesn’t serve us. People get to read and then feel like they’ve done some sort of social good. I guess I’m too much of a professor to relinquish the notion that the way we tell stories shapes what we see. The word shapes the world. If we only focus on the tragic past we’ll only see a tragic future. If we can use a different kind of storytelling method, if we can imagine ourselves differently, then we can be differently. You make the case for defining Indian identity by relationship to culture, so what did you think of Senator Elizabeth Warren’s choice to take a DNA test? I can understand the drive to want to put the issue to rest, but it didn’t put it to rest. Frankly what’s most interesting about Warren are her economic policies. Those are worth talking about. The fact that she grew up in Oklahoma hearing she was Native, that just makes her Oklahoman. She took a test, and it proved that she heard stories that were largely true. So what? The only reason it’s a story is because we’re continuing to bite the baited hook. Your father was Jewish, a Holocaust survivor who came to tribal life from the outside. What perspective did he offer on these issues of identity? He considered himself Jewish only insofar as he was persecuted. Their religion was socialism, not Judaism, in Vienna in his youth. And yet the experience of the Holocaust for them and the losses that they endured as a result of it made them keenly aware of their heritage and sharpened my father’s perception of where he came from. When he finally did come to the reservation, he described it as feeling like coming home after a lifetime of exile. It felt very comfortable. That’s the tricky thing. Identities are always constructed, multiple and overlapping. Those are largely consciously made by us. Cultures, not so much. Culture is an inherited matrix of understandings and impulses and rules, like grammar. I always think about, in relation to both those things, Karl Marx’s quote where he says that all men make history but they don’t always make it as they please. That’s always good to imagine. We’re stuck making history with what we have. You describe how we got to a place where Indians are fully American but also treated differently by the law. How does one balance that right to be different with a hope for being equal? We don’t simply want equal rights—although we do want those, because we’re American citizens. It’s that and a recognition that we belong to sovereign nations which exist inside of the sovereign nation of the United States. [Other people] hear that we operate casinos or we have different laws regarding our rights to hunt and fish in our tribal lands, things like that, and often think of them as special rights bestowed upon us in payment for poor treatment. The fact remains that our nations were here before any Europeans came. What we have are the unbroken remnants of preexisting nations around which America has built itself. We have always reserved the right to form our own government and make our own laws. We gave people permission to settle here in exchange for recognition of our tribal sovereignty. If that troubles people, they can move. Is full equality possible under those conditions? Yes, and civil rights are important, but it’s the and, not the or. In that our struggle is like that of many Americans. Those things remain for many of us out of reach. A lot of the power and rights that Indians do have now you trace to the period when the federal government forced Indian children into boarding schools, and how that brought people together. What’s it like to push back against the dominant narrative that that separation of families was solely harmful? I’m probably only truly comfortable when I’m pushing back against a dominant narrative, but it was tricky. It would have been so easy for me continue to point out the ways in which the federal government tried to destroy us. My anger, my indignation, my hurt are real. My grandmother was taken from her mother when she was 4 years old and didn’t return till she was 10. She didn’t know what it was like to have a mother and it flavored her relationship with my own mother when she was a girl and in turn it flavored my relationship with my mother. That of course encourages me to point a finger back at the government and say, You did this. It’s harder to say, O.K., but what else happened? What did we do in response? Although those schools were intended to destroy Indian tribes by destroying Indian families, they resulted in a vast network of informed, healthy, strong relationships between previously atomized individuals. Those relationships were paramount in the efforts in the ’40s and ’50s to establish strong tribal governments, among other things. What do you hope activists learn from the work of the American Indian Movement in the ’60s and ’70s, or from the more recent protests at Standing Rock? They’re already doing it. I see protests the protests that continue to go on in Minnesota around pipelines, and I’m incredibly impressed. They’re such good students of history. They’re at the front line not just of Native protests but of a larger protest that highlights the fact that the struggle isn’t between pipelines and Indians, it’s between private enterprise and the common good. After the recent Indigenous Peoples March in Washington, D.C., video of young men in MAGA hats surrounding an Omaha elder became a focus of controversy. Is there a lesson people can take away from the way that moment went viral? The surface is ugly, but the depths are profound. We could focus on [the elder] Nathan Phillips. Despite what he’s been through—and I’m imagining it’s been a lot—with dignity and compassion and gentleness even, he stayed in the fight. In his example, I see a lot of what I was trying to communicate in the book: the ways in which Indians have not only endured America but endeavored always to make it better. 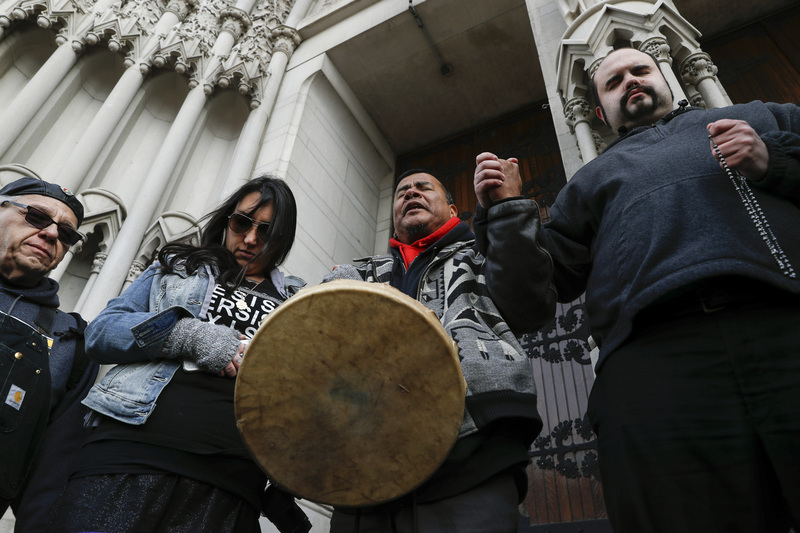 This past fall saw the election of the first two Native American Congresswomen, but also a Supreme Court ruling against the Standing Rock Sioux in a voter-ID-law case. What’s your outlook on Native participation in government? The fight continues. What can I say?